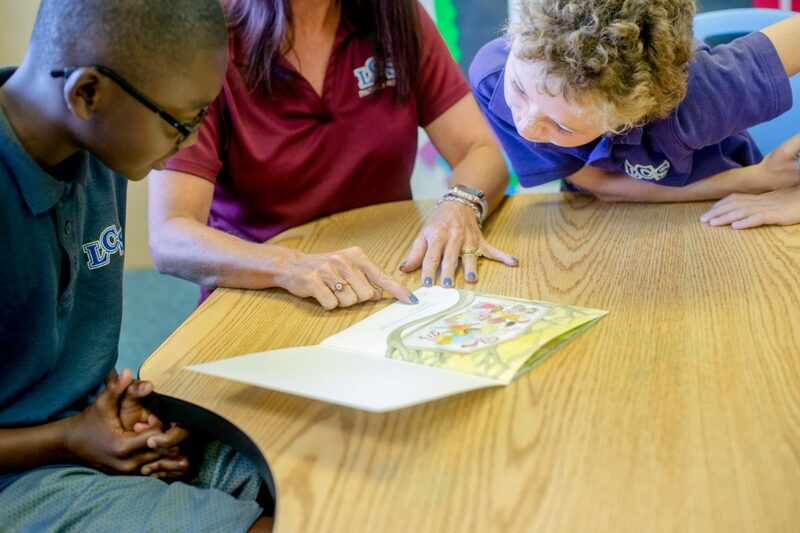 The year-round education and development of children with autism is a distinction of the LCS campus that is significantly impacting lives on a daily basis. The Discovery Program is made up of two self-contained classrooms offered to students with a specific diagnosis of autism and/or related disabilities. This special education program is available for children five to 14 years old with an emphasis on academic skills and independent living skills. Classroom instruction is based on a blended model of best practice approaches to autism treatment including applied behavior analysis (ABA), incidental teaching, picture exchange communication systems (PECS), and social skills training. The curriculum is specially modified to meet each child’s individual needs. Children are taught in a low ratio (1:4), structured classroom by teachers who have had extensive training in autism spectrum disorders and evidence-based practice. Each child’s individual education plan is reviewed annually with the parent to monitor progress and ensure program effectiveness. Tuition costs for the Discovery Program include weekly speech/language and occupational therapy and the extended school year program. The Discovery Program began several years ago with four students in one small classroom. As the children moved into their new home in the George W. Jenkins Discovery Wing of the Elementary/Middle School Building, the program immediately tripled its enrollment, with others seeking to participate. Families enrolled in the Discovery Program are extremely pleased with the quality and credentials of the faculty, and they are thankful for the many aspects of the program that are not available in the public school setting. The presence of these very special children on campus is mutually “life-altering.” Discovery students and “regular-ed” students have formed close bonds. Children see that we are all unique and can help one another. Students are learning to build relationships and solve problems – a win-win situation. 1. The inquiring family must provide current ESE paperwork for review by the Elementary Principal. 2. The Elementary Principal will perform a preliminary review of the ESE documentation and will schedule an initial family interview. For a checklist of the required documentation, click here. 3. The Elementary Principal will schedule admissions testing for the student. If the program seems to be appropriate for the student, an enrollment packet will be provided to the parents by the school registrar, Mrs. Mary Fairchild. 4. Final interviews will be scheduled. The family meets with the Headmaster and the Elementary Principal to discuss the mission of the school. The family is also scheduled to meet with Matt Green, Chief Financial Officer, to discuss financial obligations of enrollment and tuition assistance programs. If the student is not accepted into the program, parents are notified by letter or by the Program Coordinator when student testing is completed. If you have questions regarding the Discovery Program, please contact Mrs. Luci O’Byrne, Elementary Principal, by phone at (863) 688-2771 or by email at lobyrne@lcsonline.org. Tuition payments may be made annually, by semester, quarterly, over 10 months or over 12 months. All monthly tuition payments are made via electronic funds transfer to FACTS Tuition Management. The yearly fee for this service is $15 (if paying by semester) or $45 per family (if paying quarterly, over 10 months or over 12 months). There is no fee if paying annually. Summer Hours: 9 a.m. to 12:30 p.m.
School Hours: 8:05 a.m. to 2:15 p.m. NOTE: The multi-child discount does not apply to Discovery Program tuition. The Lakeland Christian School cafeteria offers a variety of meal alternatives that cater to our diverse student population. Cafeteria menus and meal item portions are created to meet the varied levels of student preferences. All menus are reviewed and approved by a registered dietician to ensure menus meet nutrition standards and nutrient composition from a variety of food sources that support optimal nutrition. Students receive three daily meal options ranging from “the classics” (home-style favorites), peanut butter and jelly sandwiches and deli-meat sandwiches. Meal service transactions are processed through a point-of-service register system which allows parents to review and monitor student purchases on a daily basis. Parents are asked to place money in their child’s lunch account and maintain a positive balance at all times. Students may also opt to bring their lunch from home. A late fee of one and a half percent per month may be assessed on charges older than thirty days. For payments returned to the school because of insufficient funds, the school will assess a $30.00 service charge. No student may be enrolled in a new semester unless all previous semester payments have been made. If a student is withdrawn during a semester, the full semester’s tuition is due. Student transcripts/records will only be released after the family account has been paid in full. Lakeland Christian School accepts the McKay Scholarship and Step Up for Students Scholarship. Families may also apply for additional financial aid. Contact the LCS Business Office at (863) 688-2771 for more information.